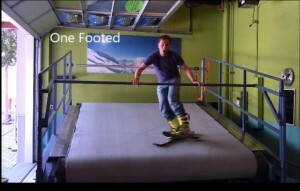 Your Reno ski lessons begin with our revolutionary training tool, the Snow Biste. Designed to provide four times the friction of snow, our skiing platform – combined with the Biste method of training – will have you ready for the mountain much faster than traditional skiing lessons. A revolutionary design in ski technology, with the Snow Biste, you won’t have to wait for the right weather conditions…you can train on your schedule, not the mountain’s! The convenience of our indoor skiing facility gives you more opportunities to build your skills while the targeted fitness training of our classes at Reno’s number two gym, Sierra Strength & Speed, trains the right muscles and builds endurance. 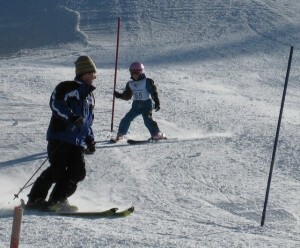 This potent combination of ski and strength training will help you master the slopes faster than other type of ski lessons being offered elsewhere. If your winter sport is snowboarding, we’ve got you covered. Riding the Snow Biste will give you the knowledge and skills you need, to confidently blast off in the wintery white this season. Can’t seem to conquer moguls? We can help you spot…and correct…the bad habits that are keeping you from improving your game. The point of any winter sport is to have fun, right? Well that’s definitely what you’ll experience on the Snow Biste. As a beginning skier or snowboarder, there’s a lot to learn, but we take it one step at a time, until you feel confident in your newfound skills. Next, you’ll learn all of the modern boarding techniques and skills you’ll need once you’re on the mountain, to confidently navigate your way on the slopes.